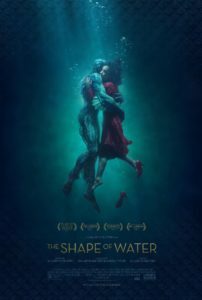 A strange and artistic movie that could have only been brought to us by creature director Guillermo Del Toro. 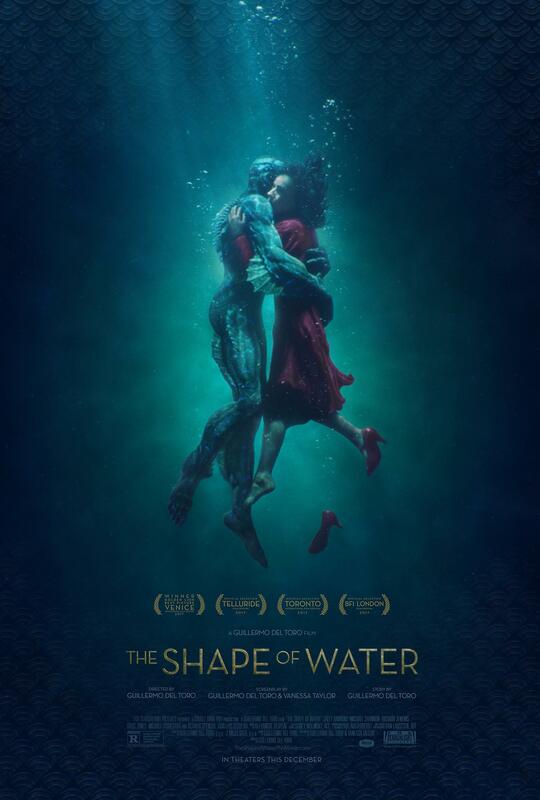 The shape of water is a fine artistic film. It’s got beautiful imagery and colors and a very cool looking creature. The story itself is pretty simple, straight forward, and predictable. A woman sees a creature mistreated in a lab and decides to break him out of the lab and set him free. This is the kind of plot that could have made for a short film. 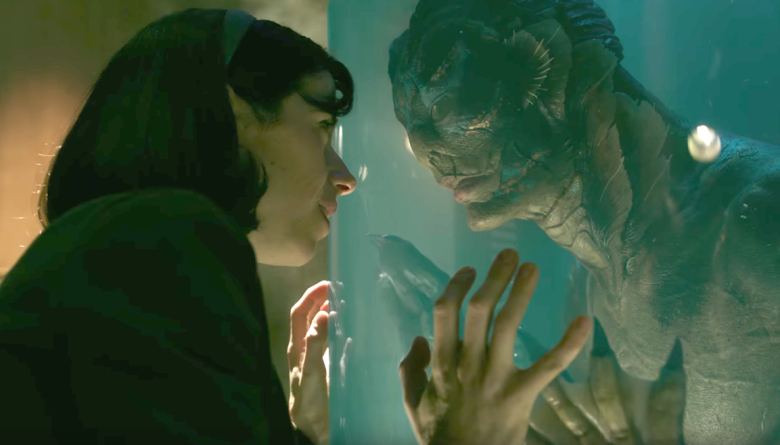 Only here, director Guillermo Del Torro takes it in directions where he explores the lives of many of the characters involved. We follow these characters in their worlds outside of the creature situation to learn about why they might partake in the kidnapping of the creature operation, and what in their lives has driven them to this. As a creature movie (inspired by the Creature From The Black Lagoon,) it’s a fine film. But as a study of some broken people who are trying to find their way in the world, it’s incredibly interesting. This movie has certainly got one of the greatest casts imaginable. Nearly every role is filled by a terrific actor. There’s Sally Hawkins playing Elisa, the mute woman who works in a lab cleaning the place and keeping to herself. Elisa’s best friend is Zelda, (Octavia Spencer,) the tough talking, caring woman who looks out for Elisa. One of their daily traditions is that Zelda holds a spot for Elisa on the timecard punch in line, and always lets Elisa jump in front of her (despite protests from other people on line.) The two of these women are the stars of this movie and have a wonderful dynamic where you can see why they are friends. Zelda understands Eliza, and cherishes their friendship. This movie is actually about characters who feel like they don’t have many friends or people in their lives. For Zelda, Elisa is her only friend at work, and for Elisa, the situation is the same. But Elisa also has a friend back home. Just like how Zelda has a husband that she returns home to, Elisa has a gentleman waiting at home for her too, only there’s nothing romantic about her relationship with him. This man is Giles, a painter, played by the wonderful Richard Jenkins. One thing that’s pretty fantastic about this movie is that we get into the lives of each character, outside of their relationships with each other. We follow the characters on their own individual paths. This idea is probably strongest with the character Giles. Richard Jenkins plays the character as a lost soul who is starting to believe he has no place in the world. Giles is gay, in a time when that sort of thing was not publicly accepted. It’s the 1960s, and both racism and homophobia are still clearly alive. Giles learns this when he goes to a diner for pie and tries hit on the man who works behind the counter. Giles has an infatuation with this man and goes to the diner every day to buy a slice of pie and talk to him. He doesn’t even like the pie, as we learn from seeing his refrigerator stocked full of it, but he certainly likes going there and talking to this man. Until one day when that talking goes too far. First the man working at the diner turns away a black couple who has come in to eat, saying they can have take-out only. And then when Giles makes his move, the results don’t exactly go well. Giles is a character that is very much a match for Eliza. The two of them are close friends and roommates. It might have been nice to see how they met or ended up living together, but this movie is more interested in telling it’s current story than it is in exploring backstory or the character’s pasts. What we do know is that the two of them live above an old timey theater and that Giles spends his days in the apartment painting. He talks to her and she understands him, but of course she cannot speak back. Aside from the diner, we follow Giles out to the place where he was once employed, and a meeting outside of the building with his former boss. Giles presents an advertisement that he’s been working on for some time and is very proud of, but the boss rejects the work, talking Giles that these days people don’t want painting advertisements anymore. They want photographs. Hearing that is like Giles hearing that he’s a dinosaur. His time is done and there is no place left for him in the world. All of this goes to explain why he would agree to help Eliza with breaking into the lab and kidnapping the creature. He’s got nothing else, other than his relationship with Eliza, in his life. Eliza feels the same way. She feels like the creature is the only one who understands her (which is kind of strange, considering that she’s got both Zelda and Giles.) But she is a mute, and considers herself not whole, and she believes this creature, who looks like an amphibian man, is kind of the same way. He seems to be the only one she can have a romantic relationship with, and so she does. But there are other characters she needs to get through first. At the lab where Eliza and Zelda are janitors, there’s the head of experiment security, Strickland (Michael Shannon,) who is the man that actually captured the creature and brought him here, all the way from the Amazon. What, exactly, the American scientists are trying to do with the creature is unknown, but what we do know is that Strickland is the guy in charge of making sure the creature stays in place. He does this by electrocuting the creature with a metal stick. At one point the creature attacks him back, and Strickland ends up losing a few fingers. This becomes part of the continued idea that none of the characters in this movie are or feel whole. Another one of these characters is a scientist who works in the lab, Hoffstetler, played by Michael Stuhlbarg. Hoffstetler is the man who is actually trying to find things out about the creature. He is also a Russian spy, posing as an American. And Hoffstetler’s allegiances are called into question. Does he serve his country or does he serve science? The reason why the two are at odds is because his Russian employers wants Hoffstetler to destroy the creature, just so the Americans don’t have access to it, to learn its secrets. Hoffstetler isn’t exactly on board with that agenda. To say this movie is about conflicted characters is an understatement. There isn’t a single character on screen here who is two dimensional. Even our villain, Strickland, becomes a fleshed out person when we see him with both his wife and his boss, the General. We watch Strickland go shopping for a new car and make love to his wife in a more animalistic way, (covering her mouth,) than how Eliza and the creature make love. Eliza is the mute, yet that’s exactly what Strickland wants his wife to be, in this moment. And the relationship between Strickland and the General is incredibly fascinating, when Strickland loses the creature and tries to explain to the General how much good he’s done for the company when compared to this one mistake. The General doesn’t care. He believes mistakes are everything, and if it happened once, than it can happen again. Guillermo Del Torro is a fantastic creature director, but too often, that’s all his movies are really about. While this directors films always have artistic and visual merit, (be it Mimic, Blade 2, Hellboy, or Pacific Rim,) it is when the director tries to push himself further and make movies about the people, and their lives away from the fantasy world, that he really delivers the best films. Pan’s Labyrinth was a perfect example of this, and now The Shape of Water is another one. It’s not a movie about a creature, it’s a movie about people living a lonely life, who find in this creature one chance to actually do something good for the world. That’s what makes this movie so special. The story itself, is kind of simple, but it’s the characters that are especially interesting and deep.